The YARN ResourceManager allocates memory and vcores to use all available resources in the most efficient way possible. Ideally, few or no resources are left idle. Tune your YARN hosts to optimize the use of vcores and memory by configuring your containers to use all available resources beyond those required for overhead and other services. YARN tuning has three phases. The phases correspond to the tabs in the YARN tuning spreadsheet. As with any system, the more memory and CPU resources available, the faster the cluster can process large amounts of data. A machine with 4 CPUs with HyperThreading, each with 6 cores, provides 48 vcores per host. Impala daemon requires at least 16 GB for the daemon. HBase Region Servers requires 12-16 GB of memory. Solr server requires a minimum of 1 GB of memory. Kudu Tablet server requires a minimum of 1 GB of memory. 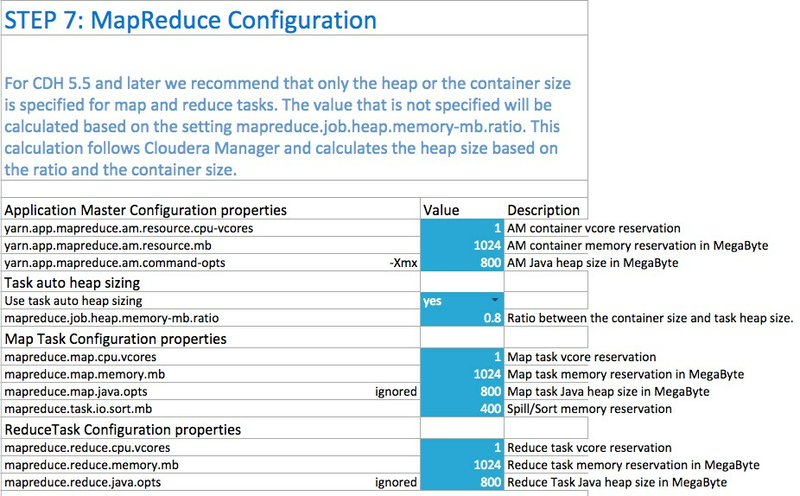 In step 6, you can change the values that impact the size of your containers. The minimum number of vcores should be 1. When additional vcores are required, adding 1 at a time should result in the most efficient allocation. Set the maximum number of vcore reservations to the size of the node. Step 6B lets you see, at a glance, whether you have over-allocated resources. You can increase the memory allocation for the ApplicationMaster, map tasks, and reduce tasks. The minimum vcore allocation for any task is always 1. The Spill/Sort memory allocation of 400 should be sufficient, and should be (rarely) increased if you determine that frequent spills to disk are hurting job performance. 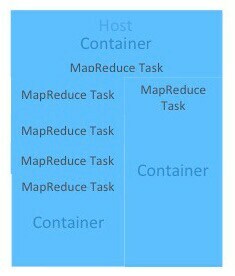 In CDH 5.5 and higher, the common MapReduce parameters mapreduce.map.java.opts, mapreduce.reduce.java.opts, and yarn.app.mapreduce.am.command-opts are configured for you automatically based on the Heap to Container Size Ratio. On large clusters, continuous scheduling can cause the ResourceManager to appear unresponsive since continuous scheduling iterates through all the nodes in the cluster. When you are satisfied with the cluster configuration estimates, use the values in the spreadsheet to set the corresponding properties in Cloudera Manager. For more information, see Modifying Configuration Properties Using Cloudera Manager.